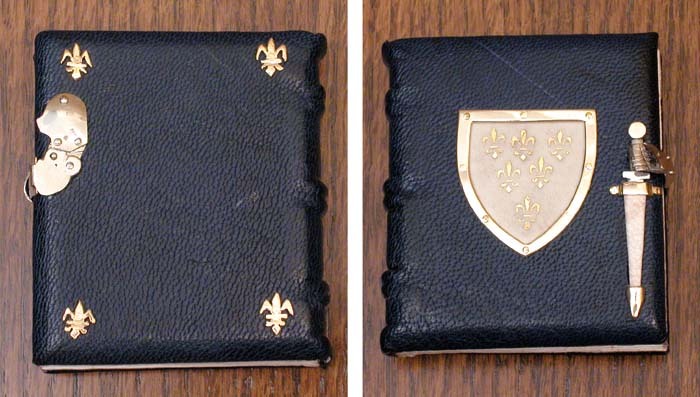 These are from a very low edition of books on the life of Saint Joan of Arc based on the original book that I made on commission for the author, Joan Knoertzer. 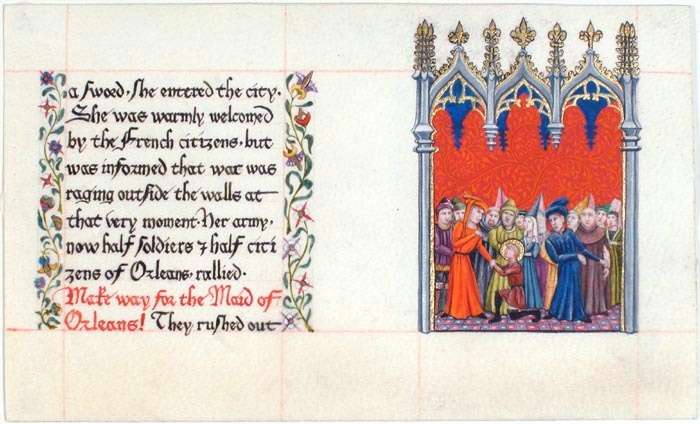 These are made by hand from actual size archival prints of the original Jeanne d'Arc book featured in the article on this web site about the making of the original book on parchment. The pages on these are scanned from the original, then printed at high resolution using fade resistant inks for extremely long life. The pages are then very painstakingly hand gilded with real gold leaf on a raised ground. Genuine gold paint was added for some special effects (like Holy Light) as in the original. The bindings of hardwood are also of a 15th c. French Gothic type of construction and sewing. The sewing was done with linen thread on a medieval type sewing frame. 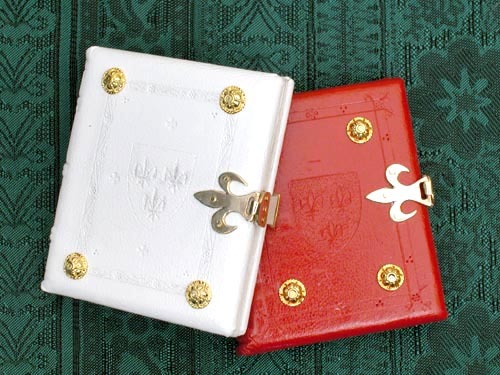 The ultra thin leather coverings were hand tooled with gothic designs. Each book is slightly different. The binding colors and embellishment vary. I have made only these seven reproductions so far because it is very time consuming. I will make more, but it is unlikely that I'll make very many. Please contact the Artist at Randy@RandyAsplund.com for pricing and availability. Covers can be custom made for you to include your preference of tooling, gilding, gem stone, leather or other inlay, or carved bone elements. 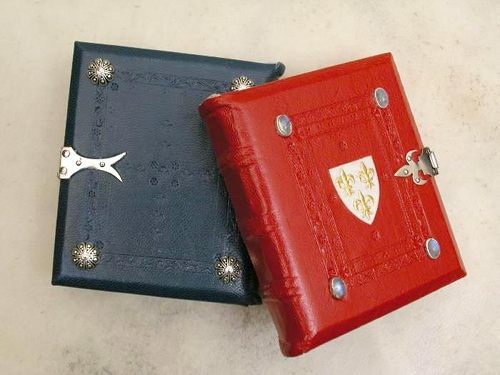 This ncludes a hand-made metal & leather clasp, genuine parchment end leaves, and the interior being carefully hand-gilded with 22 or 23k gold leaf throughout. Each book is 3" high x 2-1/2" wide. It has 48 pages. - Including 13 full page miniatures and 47 illuminated pages. Book no. 7 was finished March 29, 2008. This is by far the most lavish version so far. The thin white leather over maple boards is blind tooled on front, metalpoint and blind tooled on back, inlaid with colored leather and sterling silver bosses and garnets & peridots set in silver. It is gilded with raised gold and the gold flowers on the front have nickel studs. Although the embellishment is not one which we would likely see from the middle ages, this cover was designed to be reminiscent of the interior of a typical gothic medieval book, and the construction of the cover is of 15th c. method. These two books were made on private commission. 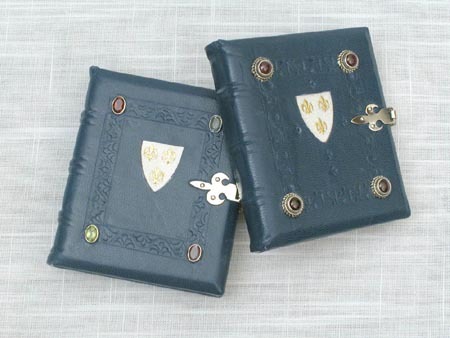 Genuine 23k gilding on most pages, walnut wood, colored leather, hand made Nickel Silver & Leather Clasps, Sterling Silver Bosses set with genuine Gem Stones, genuine parchment end-leaves, front inlay and spine liners, linen sewing. 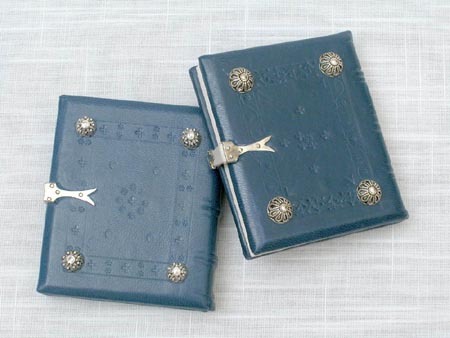 Genuine 23k gilding on most pages, walnut wood, colored leather, hand made Nickel Silver & Leather Clasps, Sterling Silver Bosses set with genuine Gem Stones, genuine parchment end-leaves, front inlay and spine liners, linen sewing. Genuine 23k gilding on most pages walnut wood, colored leather, hand made brass (Nu Gold) clasps, goild plated commercial bosses, genuine parchment end-leaves and spine liners, linen sewing.